My sense of excitement mixed with a dash of disbelief slowly gave away to an almost zen state of calm as I watched the massive old brute of a whitetail we’d named “The Big 5” lumber my way. Good fortune and the stars all aligning in my favor resulted in obtaining permission to hunt whitetails on this amazing property in early 2015. August found me scouting the place and trying to figure out the how, what’s, and why’s of the whitetails that called the place home. After glassing all evening I was pulling out of the property right at dark and rounding a corner in the road my headlights passed over a very big buck. Slamming on the brakes and backing up I got a decent look at one of the biggest bucks I’d ever seen before he melted away into the darkness. Early September was too warm to bother with elk so I decided that this particular Big 5 needed some attention. Having a pretty good feeling about where he was bedding I slipped in late one morning to hang a stand and after zeroing in on what I thought was the perfect spot, and was more than a little surprised to see someone else’s stand in the exact tree I was going to hang mine. Hmmmm…..I’m by no means a Wensel(although Gene and Barry both told me on separate occasions when I was very young that the other was my real dad.?.?.?) but I was very curious as to who the other hunter was who would pinpoint the exact same tree as me. Come to find out the other fellow had permission to bowhunt the property and had for several years. Not wanting to purposefully step on someone’s toes I contacted him and we decided to meet up and chat. It didn’t take long to figure out Trevor was (1) a very good guy and (2) a very good hunter. Having several mutual friends and acquaintances, plus the fact we were both shot traditional gear made becoming friends quite easy. I told him about seeing the big buck and finding his stand and in return he told me he’d been hunting that deer the previous season and he simply called him “The Big 5”. Because he had history with that deer I elected to hunt elsewhere as I’d seen other good bucks. For some reason unknown to us the Big 5 decided to leave his home turf shortly after that and headed a half mile east and claimed a field and thick willow bottom that became known as the Big 5 field. Trevor hunted him the rest of the season with no luck and I ended up filling my tag on a beautiful 150 model with mule deer forks on both his g2’s. 2016 and the Big 5 was in his field through both archery and general season. The wind and topography of his field and preferred bedding area made him a very difficult deer to hunt. The Big 5 field is a long narrow alfalfa field bordered on the north by the river/willows and a nasty cattail swamp on the south. Big 5 claimed the west end as his kingdom and another very heavy old deer we named Arnold claimed the east. Either deer was a shooter and Trevor and I both tried different tactics to no avail. One day while hunting some timber on the east end of the field, deer started blowing out of the west end field and running my way. Not sure what was going on I assumed someone was boating the river and stirring deer up as they passed. Quite to my surprise a large boar grizzly bear came ambling along the opposite bank of the river and passed by me on his way to parts unknown. This is the rocky mountain front and I found that it wasn’t uncommon to have bears in the river bottom. Soooo from then on my Glock 10mm and a can of bear spray went everywhere with me. During this commotion the big 5 entered my block of woods and took a low funnel of grass and trees into the thickest part of the bedding area. Several weekends later I was hunting the same block of woods and a ranch hand came out to work on the pivot in Big 5 field and bumped the Big 5 out of his bed and I watched him take the same route down to me and slip down the same funnel as when he was bumped by the bear. A little light bulb flickered in my head and after my morning hunt was over I went to investigate this funnel. Finding a heavily used trail and a perfect tree, I hung a stand and eagerly awaited the next weekend when I’d get a chance to hunt it. As luck would have it the wind was not favorable for that location and I decided to focus on hunting Arnold instead. The rut was heating up and Sunday night I finally had Arnold in my vicinity with a hot doe. A smaller buck ended up hanging out around me and when he got in Arnolds comfort zone, Arnold decided to come my way and run the little guy off. 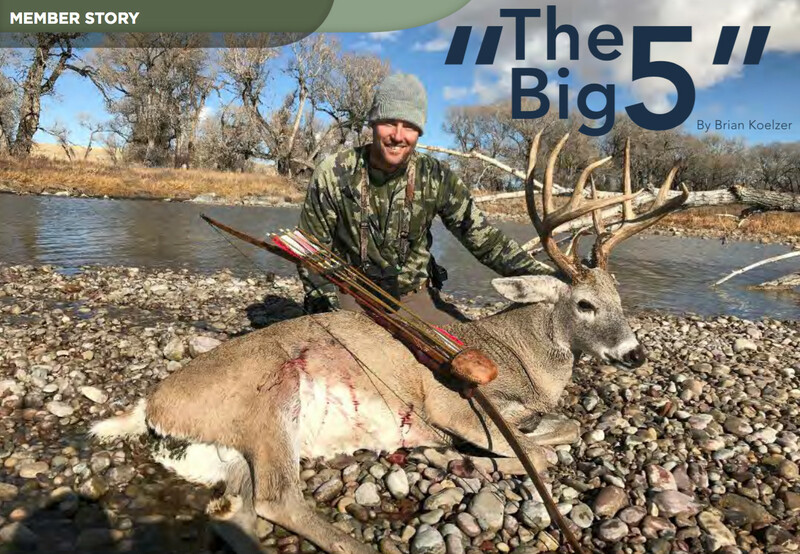 You may remember my story in a previous issue about the countless reasons we as bowhunters miss game, I made the rookie mistake of dropping my bow arm, as I released my arrow, cleanly shooting under him. Trevor ended up getting a crack at Arnold a few days later as he chased a doe by his makeshift ground blind he’d put together as yet another tactic to get the Big 5. He didn’t miss and Arnold went home with him. This changed my focus to the Big 5 and the Big 5 only. With only one long weekend left I spent the first two days hunting the escape funnel stand to no avail. Closing day I dawned hip waders and waded the river to the willows and had a friend give a gentle nudge trying to push the Big 5 my way. He must have known something was up since he shorted me about 50 yards and waded the river away from me. From heavy rutting and fighting off would be intruders he was visibly worn down and limping badly which concerned me that he wouldn’t survive the winter. The final evening, I set up thinking he may return from where I saw him go after the failed push of the morning. He didn’t show himself and just as the sun was setting I rattled in an old 4 point with a broken g3 and couldn’t resist a 3 yard shot. My arrow took him cleanly behind the shoulder and with that the sun set on hunting season 2016. Fast forward to 2017 and I was the proud holder of a Bears Paw elk permit! I dedicated nearly all of my archery season to hunting elk but as luck would have it (or lack there of) the hunting gods took turns kicking me in the groin and I ended up boiling up a big pot of not so tasty tag soup. Trevor and I kept in touch through archery season and he said the Big 5 was in his field doing his usual thing. Closing weekend of archery while set up to ambush the Big 5, a buck he hadn’t seen in a year showed up out of the blue and presented a shot which is a bad idea if you’re a big deer and Trevor is shooting at you. With the opening of general season, I was itching to get into whitetail mode and see if I could change my luck around after striking out on the elk. The wind usually doesn’t allow an evening hunt for the Big 5 so I decided to sit across the river from his field and see what was over there. Five minutes after getting in my tree I had a fawn walk by and that was the only deer I had within a 150 yards all night. Not good. Had my elk luck followed me to the deer woods? I considered sacrificing a chicken in some pagan style ceremony or maybe dancing around a re in a loin cloth whipping myself with a willow branch to appease or bring sympathy from the hunting gods. I decided against both, and the next morning decided to give the escape funnel stand a go. There was a nice stiff breeze coming out of the southwest and as day broke a number of deer came my way and two young bucks walked right by me. By 9 o’clock I figured the morning was over and was preparing to get out of my stand. Just as I was about to lower my bow I noticed a truck pull into the field off the ranch road and curious to see if they would spook any deer decided to stay put. I still have no idea who these people were or what they were doing but as they neared the willows the Big 5 liked to bed in, some deer jumped up and headed my way. The truck stopped to watch them and even though they were 600 yards away I could see a good buck slip out of the willows and sneak along the bank of the river in the tall grass coming my way. A quick check with the binos confirmed that it was the Big 5 in all his splendor. My heart started racing and my knees started to shake as all the daydreams I’d had about this moment looked like they were about to play out. It took about ten minutes for the group of deer to sneak their way down to me and he was the only buck. Back to the beginning of this story….I let him get just past me on the same trail as his does and in one fluid motion drew and released. My shaft caught him at the very back of the ribs and disappeared into his tan coat. A little far back, but I knew the shot was fatal. I said my thanks and decided to give him some time. Shortly after shooting him the wind picked up to a gale and rain began to beat down. This was very disheartening as I knew any blood would be gone. The damage was done so I decided to wait a bit longer before taking up the trail. Since blood was out I decided to get the wind in my favor and take the river down to where the deer cross and work backwards to where I’d last seen him. The wind was still howling when I got to the river crossing and as I crept into the willows and grass I barely made it 20 yards when I saw his horns laying at. Even though he looked like he was done I knew better and nocking an arrow slowly started to approach him. At 15 yards he lifted his head and finding a tiny hole through the blowing grass and willows I sent an arrow through his chest. One short burst and he expired on a gravel bar in the middle of the river. As I waded the shallow channel out to where the fallen monarch lay it was with a great feeling of reverence and remorse that I knelt down beside him and touched him for the first time. His face was scarred from countless battles and his head was grey like and old Labrador retriever. The old king had fallen but his story will live on with those of us that knew him.